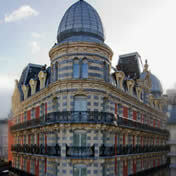 We have carefully selected a great range of three and four star hotels in Lourdes. All of these hotels are located in or around the town and are within a few minutes walk to the sanctuaries. All Marian Pilgrimages hotels in Lourdes are on a full board basis. Rooms can be single,twin or triple with en-suite.The majority of the hotels cater for disabled guests with facilities and rooms for wheelchairs. The numerous facilities coupled with the close proximity to the sanctuaries make every pilgrims trip to Lourdes a peaceful and relaxing experience.